The second book in my pile of books to read over the Summer was Charles Leadbeater's 'We-Think'. Charles is signed-up to be one of the keynote speakers at the LTS organised Scottish Learning Festival in September. The inside cover of the book describes Leadbeater as 'one if the world's leading authorities on innovation and creativity' so just what we need to inspire the 7,000 teachers and others who will be at SLF2008. I have enjoyed reading Leadbeater over many years and admire the way that he carefully constructs. I took most of this week off to catch-up with stuff around the house and the garden. It was the first week of the school holidays in Dundee so a great time to be on leave. I still haven't got over the feeling, from my time as a teacher, that the first week in July is the start of the summer. 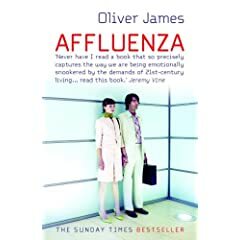 I associate the school summer holidays with reading and have just finished Oliver James' 'Affluenza'. It is a good read and makes a lot of sense but left me thinking that there was not much.